Two park commissioners are openly questioning the wisdom of continued pumping of groundwater to keep the Hiawatha golf course from flooding. Scott Vreeland and John Erwin raised questions about the practice of pumping an estimated 263 million gallons annually when the Park Board was briefed Wednesday night about the latest plans for investigating whether and how much pumping should continue. Assistant Superintendent Michael Schroeder told the board he'll have a recommendation next July on whether to continue, reduce or eliminate pumping groundwater from ponds at Hiawatha into the adjoining lake. He said he'll update the public on next steps on Nov. 29 at 6:30 p.m. at Powderhorn Recreation Center, 3400 15th Av. S.
Vreeland said the situation reminds him of putting a finger in a dike, with the lake elevation higher than major portions of the course. The Park Board may have to turn off pumps and work with homeowners to address "a slow disaster that is potentially headed their way." Consultants and the Park Board have identified 18 homes in the area that potentially could face water in their basements if twin large-capacity pumps are turned off or their volume reduced, which would allow the groundwater level to rise. One possibility in those scenarios might be to install basement sump pumps. Erwin questioned the sustainability of using an estimated 70,000 kilowatt hours annually to run the golf course pumps, with an estimated annual cost of about $10,500. Schroeder said observations of golf course employees suggest that the course is sinking. That could be because the continued pumping may allow compression of spaces vacated by groundwater between peaty soil particles. He said that monitoring plates will be installed if consultants recommend that to try to measure the rate of any subsidence. Another wrinkle was introduced when Schroeder told commissioners that impediments in Minnehaha Creek downstream of Lake Hiawatha may be having an impact on the lake's level. He said those haven't fully been investigated but at least a large gas pipe and a weir that impound water could being keeping the lake higher. Removing them might lower the lake slightly. The board briefing partly covered material already presented to Hiawatha area neighbors in June. But it also outlined factors that a team of consultants will address to help develop the preferred option by July. Among the factors that Schroeder said will guide that recommendation are pumping volumes, impacts on the golf course, water quality and ecological impacts, effects on nearby homeowners and public utilities, and the likelihood of gaining regulatory approval. The process is unfolding under a three-way agrement of the Park Board, city and Minnehaha Creek Watershed District. Schroeder said DNR officials who issue groundwater pumping permits told him that the Park Board may need two to five years to fully investigate, analyze and gain approval for what it proposes to address the problem. The Park Board's consultants began gathering data about the area's hydrology a year ago. 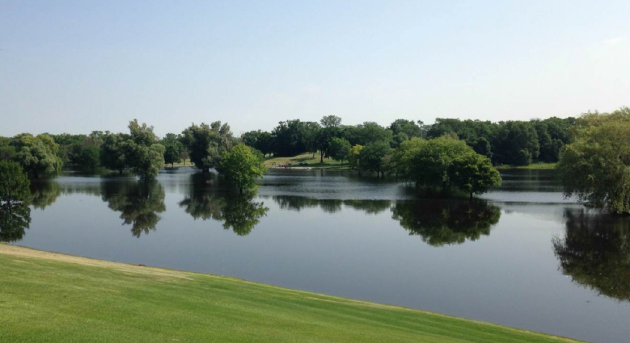 The issue arose when torrential rains in the early summer of 2014 flooded lower areas of Hiawatha, and also its Meadowbook golf course in St. Louis Park . All 18 holes at Hiawatha are now open, with the DNR permitting pumping on an interim basis while studies continue. But the course remains vulnerable to renewed flooding in heavy precipitation, Schroeder said. A 2014 analysis described the Hiawatha course as having favorable population density nearby but hampered by an inadequate clubhouse, and challenged by irrigation and drainage issues. The course opened in 1934 on land dredged from Lake Hiawatha. It averaged about 47 percent of its practical capacity, around the midpoint for Park Board courses, according to the analysis.